The UFT Teacher Center, founded in 1979, is a school-based professional development program that promotes teacher excellence and academic achievement for all students. The Teacher Center operates throughout the five boroughs of New York City in 105 school-based sites and numerous outreach locations. Drawing on current research and best practices, the Teacher Center’s professional development activities for educators are designed to deepen content knowledge and enhance pedagogical skill. Activities range widely and include intensive in-classroom support, after-school study groups, citywide networks, conferences and seminars. The Teacher Center is a collaboration of the UFT, the New York State Education Department, the New York City Department of Education, participating schools and districts, school support organizations and metropolitan area universities and cultural institutions. 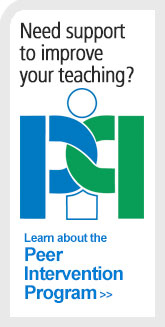 Visit the Teacher Center website to learn more about conferences, seminars and networks during the school year, or to access its many professional resources to help teachers with instruction.